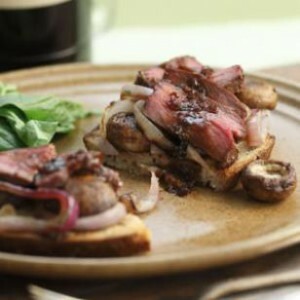 This open-face, “fork and knife” sandwich is piled with slices of Guinness-marinated bison steak, mushrooms and red onion. Combine beer, sweet onion, soy sauce, molasses, rosemary, garlic and Worcestershire sauce in a large sealable plastic bag. Add steaks. Seal the bag, shake and turn it, and refrigerate, flipping over and shaking the bag from time to time, for 12 to 18 hours. Preheat a grill to medium. Remove the steaks from the marinade and pat dry. Reserve 1 cup marinade (discard the rest). Brush mushroom caps and onion slices with oil, sprinkle with salt and pepper and place in a grilling basket. (No grill basket? See Tip, below.) Place the basket on the grill; place the steaks directly on the grill rack. Grill the steaks and vegetables until browned on the first side, 5 to 7 minutes. Turn everything over and grill until an instant-read thermometer inserted into the center of the steak registers 125°F for medium-rare and the vegetables are soft and lightly browned, about 5 minutes more. Remove from the grill and let rest for 5 to 10 minutes. Lightly grill or toast the bread. Meanwhile, place the reserved 1 cup marinade in a small saucepan and bring to a simmer over medium-high heat. Boil until reduced by about half, 7 to 10 minutes. Divide the mushrooms and onions among the pieces of toast and drizzle each with about 1 tablespoon of the reduced sauce. Slice the steak; divide among the sandwiches and drizzle with more sauce. Pour any accumulated juice from the steak over the sandwiches and serve with a fork and knife.